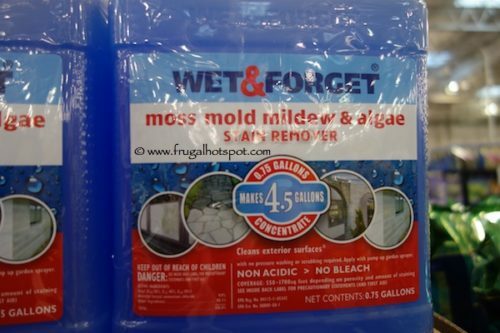 Select Costco locations have the Wet & Forget Moss Mold Mildew & Algae Stain Remover (2/0.75 Gallons Concentrate) on sale for $19.99 (after instant savings), now through March 24, 2019. That is $5 off Costco’s regular price of $24.99. The Wet & Forget Moss Mold Mildew Mildew & Algae Stain Remover is used on your dry exterior surface and there is no rinsing needed. The elements (wind and rain) will slowly wash off the stain. You can expect to see visible results over time. There is NO bleach in this product. One 0.75 gallon concentrate makes 4.5 gallons of product. Item #361065. While supplies last. This product was spotted at the Covington, WA location. Price and participation may vary so it may not be available at your local Costco or it may not be on sale at your local Costco or it may be a different price at your local Costco. Prices may change at any time.